Once you’ve decided to start shopping around for a second-hand car, it’s time to get stuck into some serious research. The first thing to work out is the type of vehicle that serves your needs best – a roomy family car, a durable SUV, a compact car for optimal fuel economy or, if you’re a teenager, maybe an affordable and reliable ‘starter car’ that ticks all the boxes for safety but still falls within your ‘almost broke student’ budget. Check out our round-up of some of the best second hand cars in Australia, keeping in mind that the term ‘best’ can mean different things to different car buyers. Budget Direct used Canstar’s latest customer satisfaction data to create a list of car makes for each car segment: Small Cars, SUV’s, Cars for Teens, Family Sedans, and Dual Cab Utes. A shiny, brand new vehicle can be a beautiful thing, but there are those who might consider it an unnecessary expense. Sure, a new car smells nice. It hasn’t been ‘sullied’ by a previous owner. It’s less likely to break down than a used car. And some of today’s new models feature some very impressive safety technology and advancements in fuel efficiency that leave last century’s cars in the dust. But there are some pretty huge advantages to buying a used car, too. The steepest drop in depreciation value will have already occurred. Even when you buy a model that’s just a few years old, you’ll still save a lot of money on the sale price compared to the new version. The insurance will tend to be less expensive too, since the car’s monetary value is lower. And hunting down just the model you want at the price you’re prepared to pay is easier than ever – everything’s online these days and there are a ton of choices out there. Older cars are normally less fuel-efficient and emission-friendly and may lack a lot of the safety features and tech gadgets that new car owners now take for granted, like side airbags, navigation systems, immobilisers, rear cameras, Bluetooth and other 21st century goodies. Still, there can be a lot to smile about when you buy a quality used car – not least of which is the fact that you can avoid all those new-car dealer fees, and nobody is going to try to talk you into paying an extra $600 for optional rust-proofing or offer you some overpriced add-on floor mats. As for that ‘new car smell’ that everyone raves about, your health is better off without it, since it consists (at least partially) of some rather dubious airborne chemicals. 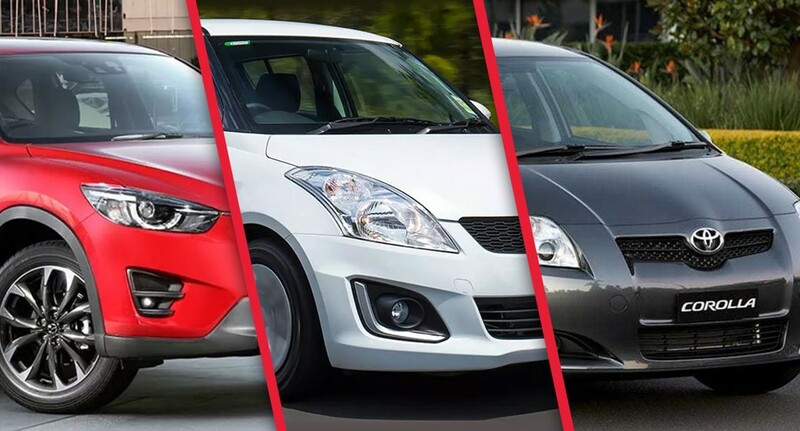 While the term ‘best’ can mean different things to different car buyers, here’s a selection of some of the more popular choices for people in Australia looking to purchase a reliable second-hand vehicle. There are hundreds of others to choose from, of course, but these are some of the tried and tested models that have proven their worth over time and consistently rate well in Canstar’s customer satisfaction surveys. Obviously, if you’re a basketball player-sized human, this car isn’t going to be your first choice, but for normal-sized people it has more than enough room inside, with plenty of adjustability in the positioning of the seats. As a Swift owner, your car insurance costs will be at the lower end of the scale, which is always good news for any teen. The BMW 3 Series always seems to be one step ahead of the competition, so it comes as little surprise that it tops our list of the best used family sedans in Australia. The BMW 3 Series’ infotainment system is top class, thanks to its precise presentation, speed, and overall user-friendliness. In terms of actual driving, the BMW 3 Series’ engine has everything you could want and then a little more. Impressing at both high and low speeds, the 3 Series is extremely quick to respond, and should be commended for its refinement. When it comes to design, the BMW 3 Series is also top class, pairing a sleek – though not showy – interior with ample storage room and comfortable leather seats. The Ford Mondeo doesn’t necessarily go out of its way to impress. Then again, it doesn’t need to. Rather, its smooth, reliable performance does the talking. Whereas other cars will attempt to impress with flashy designs or high-tech gadgets, the Mondeo prefers a more understated approach. Consequently, it ticks all the boxes and does the basics superbly well. From a comfortable interior to decent storage space and a modern, intuitive multimedia touchscreen, the Ford Mondeo has everything you could want for a pleasant ride. Pair this with an engine that offers solid punch, and you have the recipe for an excellent – and extremely dependable – family sedan. When it comes to dual cab utes, the Ford Ranger is in a class of its own, which is saying a lot, given the stiff competition it faces. Combining good looks, a great driving experience, and an impressive set of features, it’s easy to see why we chose the Ford Ranger as the best used dual cab ute in Australia. Some of the Ranger’s more flashy features include adaptive cruise control, lane departure warning, and lane-keep assist.